The Golden-backed Weaver Ploceus jacksoni is a common weaver in East Africa. The male in breeding plumage has a black head, and chestnut and yellow underparts. The Black-headed (or Yellow-backed) Weaver male is similar and overlaps in range, especially around Lake Victoria. The Golden-backed Weaver can be distinguished by its red eye and yellow back (the Black-headed has a brown eye and brown back with a yellow nape band) - see pic. The female and non-breeding male are olive above and yellow below, with a reddish eye. George Shelley first described and published the first illustration of the adult male (above left). Some interesting photos of these birds in moult may be seen here. No subspecies of the Golden-backed Weaver are recognised. 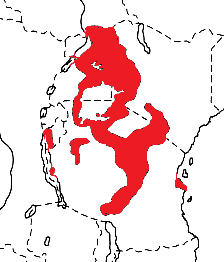 It is found in Uganda, SE Burundi, W Kenya, and in N, E and central Tanzania; it is rare in South Sudan (see map right, based on Birds of Africa). It has been introduced to the United Arab Emirates (since 1992), and Singapore (since at least 2011), probably due to escaped cage birds in each country. The Golden-backed Weaver inhabits mainly wetland areas like swamp, ambatch, reeds, papyrus, and along rivers, but also moves into acacia scrub and woodland. It shows irregular irruptive movements in response to heavy rainfall. Food consists of seeds, and probably insects. The song at its colony includes a variety of harsh notes (click on "play" below to hear its song). The Golden-backed Weaver is polygynous and colonial, often nesting alongside other weavers. Its nest is oval, compact, woven of strips torn from grass or palm leaves, lined with grass tops and some feathers. There is no entrance tunnel. It is built over water in papyrus or reeds; also in acacia trees, ambatch bushes and in maize fields. 2-3 eggs are laid, which are blue, with purple-brown or dark red spots. 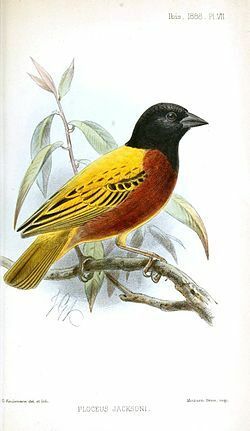 The Golden-backed Weaver has 3 PHOWN records, 2 from Tanzania and 1 from Kenya. Many more PHOWN records are needed for this locally common species (see PHOWN summary). Submit any weaver nest records to PHOWN (PHOtos of Weaver Nests) via the Virtual Museum upload site.